Big Cheef is an example of a superior tomato variety stabilized from an original mystery cross of Brandywine Sudduth and an unknown green flesh tomato in Murfreesboro, Tennessee. 15 or more seeds per pack. Heirloom Seed Packet. 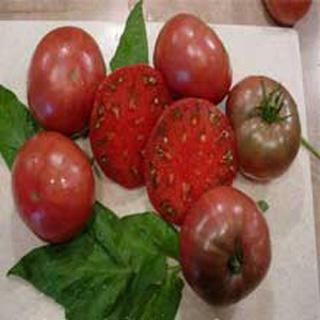 Big Cheef is an example of a superior tomato variety stabilized from an original mystery cross of Brandywine Sudduth and an unknown green flesh tomato in Murfreesboro, Tennessee. These seeds in this offering represent six consecutive generations of selection for large to extra large, maroon beefsteak on healthy, very productive, potato leaf vines. Big Cheef has proven its value as a superior tomato at the table and in the heat and humidity of Carolina, Texas, Mississippi, and southern Midwest gardens. It also has done well in the North. Indeterminate; 8 – 14 ounce flattened globe; Midseason; 15 or more seeds per pack. Most tomato flavor and super sweet that I have ever tasted!!! Just the right amount juice and seeds (but I like seeds). But as I said, an exceptional tomato flavor with a real sweetness to it. Very low acidity.